← How Can Death Enhance Our Life? Travelling across Canada with Oren is one of the great trips of our lives. I have taken hundreds of photos from trains, coaches, on foot, walking through canyons and across bridges. But today my heart whispered not here. We travelled past medicine mountain out of Jasper and past Medicine lake until we reached a place called Maligne Lake which is in Jasper National Park in Alberta Canada. There we boarded a boat and travelled 40 minutes to a sacred site for the First Nation people called Spirit Island. It is actually a peninsular. The island is a spiritual place for the Stoney Nakoda First Nation, who believe mountains are physical representations of their ancestors. The fact that Spirit Island is surrounded on three sides by the same mountain range is very rare and makes it particularly significant to the Stoney. There, many years ago the First nation people would have spiritual ceremonies until the white people stopped them. 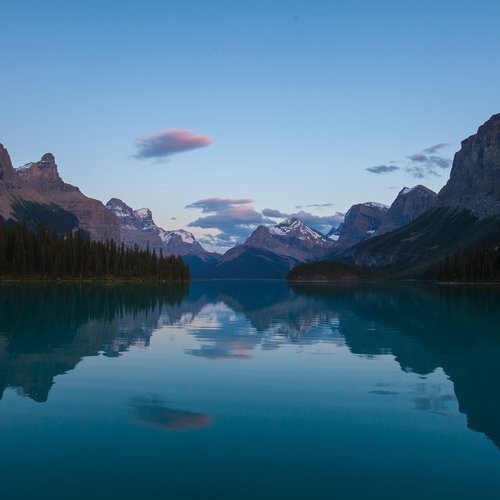 The Stoney Nakoda First Nation people now live on a huge reserve, and thankfully have begun to return to Spirit Island to reconnect to their original cultural traditions. No one else is allowed to actually walk through the island. Only on the tiny board walk made for visitors. Stepping onto the Island I had a sense of great peace and yet a heaviness in my heart. I sat down in a quiet spot to connect to my heart. According to some accounts of First Nations mythology, Spirit Island gets its name from two young lovers from feuding tribes who used to meet secretly on the island. However, when the young woman eventually confessed her forbidden affair to her father, one of the tribes’ chiefs, he banned her from ever returning to the island. Heartbroken, her lover continued to return to Spirit Island throughout his life, hoping to see his beautiful lover again. But she never came and he eventually died on the island, where his spirit still resides. Did I feel the spirit of this heartbroken lover? Did I feel the longing of the First nations to return to dance and pray and make ceremony on this, their land again? I don’t know, but what I did feel was the sacredness of this space and the whisper from the mountains asking me not to take a photo. To simply Be in the energy of Spirit island. When we got back on the boat I asked Oren whether he took a photo, because it is on Jasper’s list of most photographed spots and he turned to me and said no. He didn’t feel it the right thing to do. Lovely, Sharon. Thank you so much for writing and sharing this. Great show of connection between you two and the land. At the end of the day you can’t photograph an experience, or completely explain it to anyone else. Irrespective of all our modern technology there is no camera that can really capture the majesty of mountains or their surrounds.